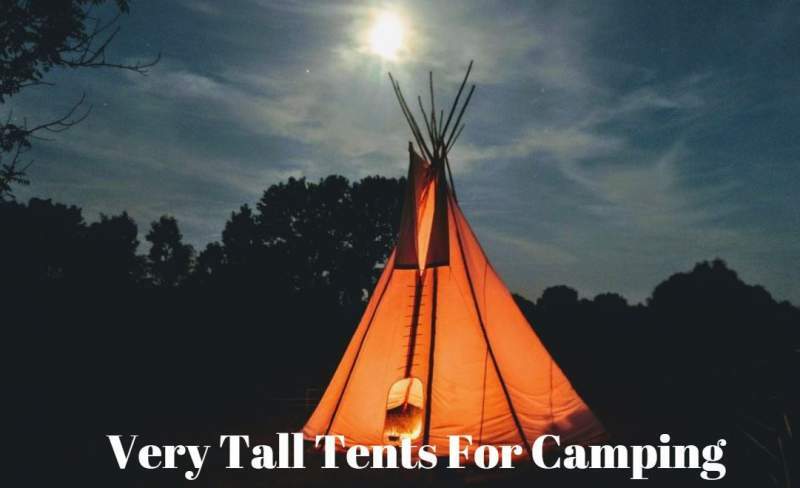 Here you have a list of 27 very tall tents for camping all above 215 cm (84.6 in) in various styles and for various use from 1 to 4 seasons. The list includes the dome, tunnel, tipi, and cabin tents. When you think about tall tents, you would expect first to see cabin tents, so indeed some of the tents here are in this category. But you will be surprised to know that the tallest tent here (as of the moment of writing this text) is, in fact, a dome tent. Now, this must be something extraordinary, right? I can tell you it is indeed, you will see below. There are also tunnel tents here. These are structures that are tall almost all the way along their main axes, so they are very livable and pleasant. You might think that nothing can beat the mentioned cabin style tents when it comes to livability, but wait to see some of the tunnel tents below. But there are also circular canvas tents here, and those are the highest. There are tipi tents as well, those are tall structure by their nature. Some of the tents are for summer camping only, or maximum 2 seasons. Those are mainly cabin tents. The reason is that they are with huge windows and doors, with minimal fly, etc. So they are great for a warm climate and they provide an excellent ventilation, but such structures do not preserve the warmth, and they are also not for strong rains and winds. On the other hand, the tunnel tents here are with solid windows, without mesh, with a great waterproof rating, etc. So they are for wet areas and also for a cooler climate. You can also use them in areas with lots of dust and sand in the air, they are fully enclosed and offer a full protection. There are examples of true winter tents as well. You will see the best of the best below. Some of the tents are with air beams. Most of them are with classic poles, and those can be aluminum or fiberglass. Some of the tents are with the waterproof rating among the highest on the market in general. There are canvas tents here as well. The tents in the list are ordered by the height from lower to higher. The list includes the tents with a height of 215 cm or higher. So why this limit? There are no particular reasons except that this is a rather exclusive group. For example, there are many tents in the range 200 – 213 cm, but those above 215 cm are rare. But you will see below, I give also a separate list with the tents in the height range 210 – 213 cm. All tents mentioned here are presented in detail in my separate reviews, so you can follow the links to read more. Coleman 6 Man Fastpitch Air Valdes Tent XL. As you realize from the name, here you have a tent with air beams combined with two classic poles used in the porch area. The tent is only for 6 people, but you have a huge area in its 4 separate rooms, no less than 344 ft² (32 m²). The tent is with the dark rest design so it blocks 99% of the daylight. You have also an impressive waterproof rating of 4500 mm. The peak height is 84.6 in (215 cm) so you realize why it is included here in the list. Please follow the link below for more. This is a tent from the Elite series, with 3 dark rest rooms and solid PVC windows. This is a tunnel style tent that offers 181 ft² (16.8 m²) of the floor area. The peak height here is 84.6 in (215 cm). This is a versatile design which offers several inner configurations. This is because of its structure which includes the sleeping areas as tents within the tent. The waterproof rating is 3000 mm. 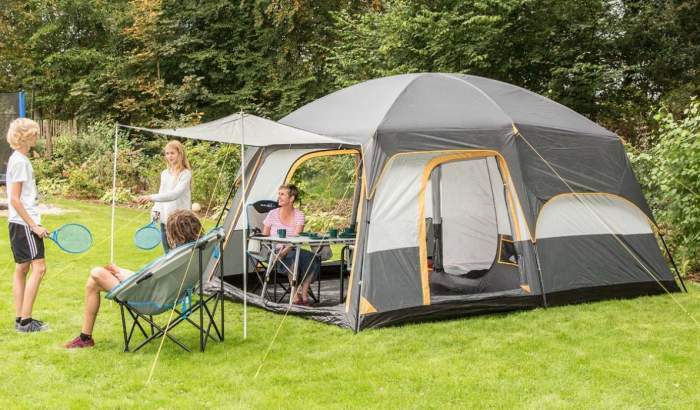 Ferrino Chanty 5 Deluxe Family Tent. This Chanty 5 is here because of its 215 cm peak height, but this is also a deluxe camping option which offers 161 ft² (15 m²) in its 3 rooms. The sleeping area includes two separate tents and this is a double-layer zone, and in addition you also have the pleasant living room visible in the picture above. There are 3 large doors and all equipped with mesh and panels, and you also have two zippered windows that are also with mesh and panels. The inner tents have their own floors but you also have a fully sealed second layer, the main floor. The waterproof rating is 2000 mm for the shell. For the floor of the inner tents you have 2500 mm rating, and you also have the polyethylene main floor which is fully waterproof. The poles are fiberglass. This is a true 3-season tent with excellent ventilation. It comes with numerous stake points and guylines to secure it against winds. There is not much one could object to this tent except for its price which is high. Please follow the link for more. The Clarkston 6A is 215 cm tall, so it is here with good reasons. This is also a very large tent with 4 rooms and 290 ft² (27 m²). One more unusual feature here is that this tent comes with air beams instead of classic poles. You have a pump included. The sleeping zone is a tent within the tent and with dark rest features. You have 8 PVC windows and they are all tinted, plus three windows of the same type on the 3 entry doors. They all have shutters for privacy, so this is a very pleasant and livable construction. The waterproof rating is 4000 mm for the shell and 10000 mm for the floor. So you realize that this is a very reliable tent for a 3-season use. The tent is fully enclosed so it is very suitable for camping in cool weather and with a lot of rain. Please read more in my full review. Arctic Oven 12 Extreme Tent. Here you have a true winter tent designed to work with a wood stove. Everything is designed for extreme conditions. You have a full coverage fly and the inner tent without mesh but built from a unique Vapex fabric. The tent is for 6 people and it offers 152 ft² (14.1 m²) of the inner area plus 46 ft² (4.3 m²) under the vestibule. The peak height is 7’2” (218 cm). Price-wise, this is one of the most expensive tents here in the site. Please follow the link to read more. CORE 10 Person Straight Wall Cabin Tent 14 x 10. This is a freestanding tall structure with the peak height of 86 in (218 cm). When you combine this with its cabin style design with straight walls and large windows, you realize how pleasant this tent is. The tent offers 140 ft² (13 m²) of the floor area which is organized in two units with a removable divider. So clearly this is not enough space for ten people, better downgrade it by half and you will have a great camping tool. The design is for summer camping and not for a cool environment. Please follow the link for more. The Desert Canyon 6 is a new item on the market. As you realize from the name, the capacity is relatively small, but the structure is very tall, so the peak height is 86 in (218 cm). The inner area is quite modest for the declared capacity, only 100 ft² (9.3 m²), so it is best to downgrade this drastically to 2-3 people only. The fly is partial coverage and the tent is incredibly tall, so it is best to use it for summer camping in a quiet area without much wind. Timber Ridge 8-Man Log Cabin Tent. This Log Cabin tent is a framed design which means that the frame is set up separately and it is fully self-supporting, and then the tent is attached to it. It is here in the list because of its exceptional height of 86 inches (218 cm). This is a single-room structure with 108 ft² (10 m²) plus a porch of 48 ft² (4.4 m²) which you see in the picture. The porch is not fully protected from elements but you have a mesh around so you are safe from flying insects. The fly is minimal and with 800 mm waterproof rating. You have one entry door and 4 large windows with mesh and panels. This is a heavy tent with its 47 lb (21.3 kg) of weight, but the carry bag is with two wheels so you can move it easily to short distances. With its peak height of 220 cm (86.6 in), this Edmonds 5A tent deserves to be here in the list of these tall giants. It also offers no less than 21 m² (226 ft²) yet its declared capacity is only 5 people. So it can accommodate far more people, I would say 8 – 9 easily. 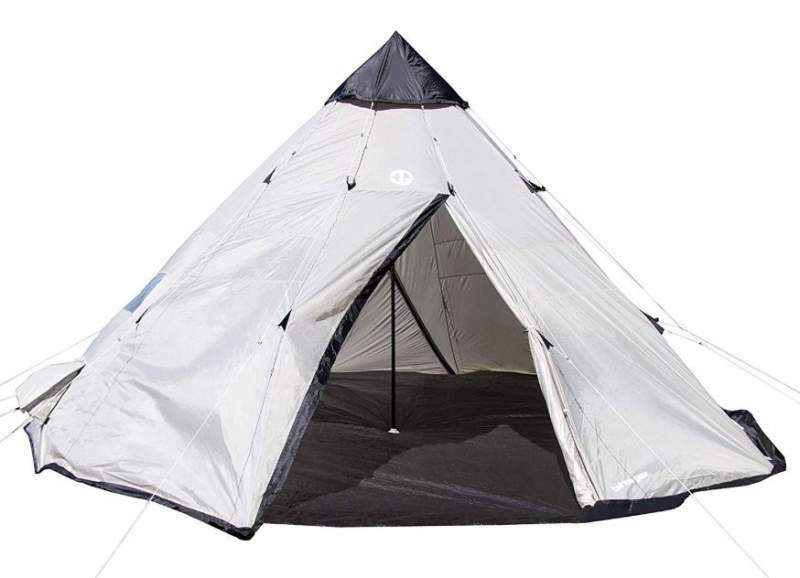 This is also a tent with air-beam technology, without classic poles. It comes with PVC tinted windows, three entry doors and all with mesh and panels, and you have 4-rooms here and these include 2 sleeping rooms, a large living room, plus a fully enclosed front room with a removable floor. The waterproof rating is very high, you have 4000 mm for the shell and 10000 mm for the floor. Please read more in my full review. The Vermont XLP 7 person tent is with all good reasons here in the list. This is a very tall tent with its 86.6 inches (220 cm). But such a height is supported with very strong steel poles and you have them 10 on the sides and 5 on the roof. So you will not find many stronger structures on the market. The area is 371 ft² (34.48 m²) and it is organized in 5 rooms. The tent is very heavy and the total weight is 125.5 lb (56.8 kg). Note that this is in two separate packages for an easier handling. There are 3 entry doors and 4 inner doors, and they are double-layer design with mesh and with panels, so you have both ventilation and protection. You also have PVC windows, tinted and with shutters. The waterproof rating is huge, 6000 mm for the shell tent and 10000 mm for the floor. It comes with many great features like a built-in wardrobe, around 20 storage pockets, and several cable entry points. You also have a thermo-reflective coating and a dark rest design. Please follow the link to read more. Skandika Weatherproof Tonsberg Unisex Outdoor Dome Tent. 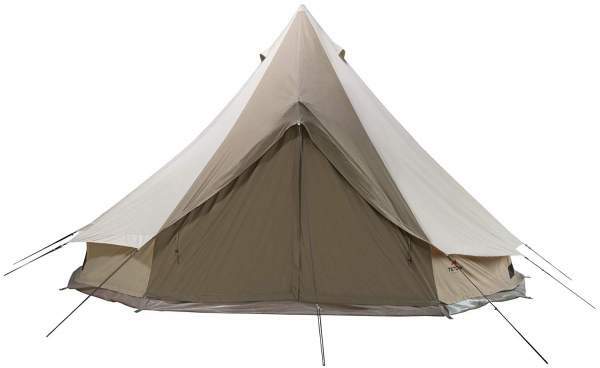 With its 86.6 inches (220 cm) of the peak height, this Tonsberg tent surely deserved to be here in the list. Apart from such a height, this is also a very generous design for 5 people, it offers no less than 135.6 ft² (12.6 m²) of the floor area. Note that I use the name as it is used by the manufacturer and you see the word dome in the title, but in fact, this is a cabin-style tent with straight walls and many doors and windows. This is a 3-room structure with a large living area and two sleeping units, with 3 entry doors, 2 inner doors, and a pleasant awning, so I have included it in my list of 3-room tents. The weight is 33.07 lb (15 kg), so it is a bit heavy but this is a big and tall tent with 8 steel poles and several fiberglass poles, and those are all heavy materials. The floor is fully sewn-in and the waterproof rating is 4000 mm for the fly and 2000 mm for the rest. 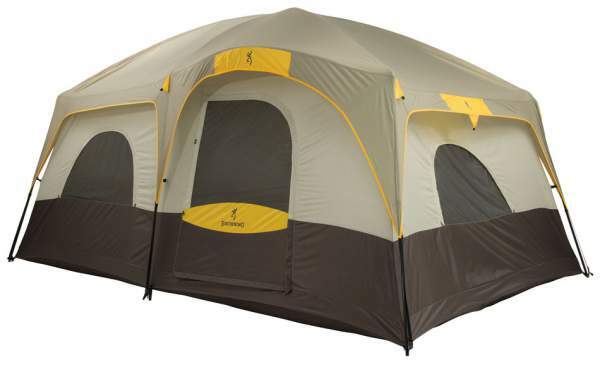 Browning Camping Big Horn Tent For 8 People – a cabin style tent. The Big Horn 8 is in the list here because of its height, so this is an impressive structure with 87 inches (221 cm) at the peak. This is also a cabin style tent which means that the volume is huge, so the structure is very livable and pleasant. The tent is with two doors and a removable divider. Each of the doors has its own entrance. The total area is 150 ft² (13.9 m²). As you realize from the picture, the tent is with a partial coverage fly, so I would use it for summer camping only, and at places without much wind. More in my full review. Chinook Titan Lodge Aluminum Tent – 8 Person. This Chinook Titan Lodge is here because of its exceptional height of 88 inches (224 cm) which is not so frequent in dome style tents. But it has many other great features. The declared capacity is 8 people and it offers 140 ft² (13 m²) of the inner floor area, and as you realize from the picture, it is with a full coverage fly so I have included it also in my list of tents with full fly. It has a very good waterproof rating of 2000 mm and it also has a strong aluminum frame which includes 4 poles that create 5 intersections. Note also that it has 2 rooms and 4 extra large doors, and those are quite remarkable features for a dome tent. The tent is fully freestanding but it has plenty of guy-out lines to stake it down and secure against winds. The weight is 30 lb 4 oz (13.7 kg). Eurohike Buckingham Elite 8 Tent. This is an exceptional design, a tunnel type tent with 5 rooms. Those include one large living room plus 4 sleeping units with the dark rest design. The tent offers 249 ft² (23.1 m²) of the floor area. Everything is impressive here, the waterproof rating included, it is 3000 mm. But the reason for having it in the list is its height. 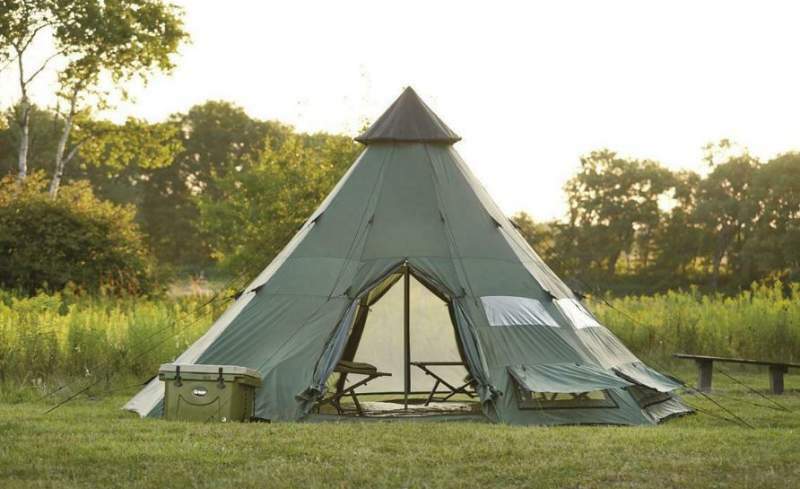 This is one of the tallest tents on the market, with the apex height of 88.6 in (225 cm). Please follow the link to read more. Crua Core Dome 6 Person Tent. You realize from the name and from the position in the lust what you have here. So this is a dome tent, but a unique one. 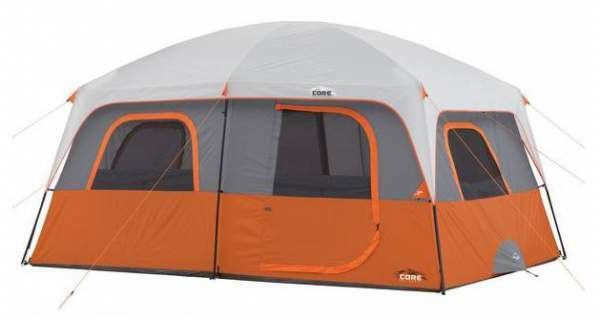 So this is a tent with air beam technology and it is designed as a core part for the Crua Clan. 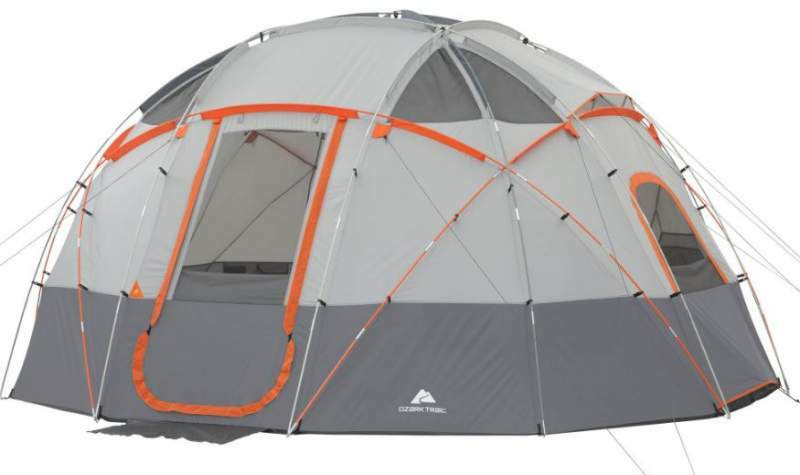 You have 3 huge doors, a huge porch, and this is a tent with 229 cm peak height. The inner area is 192 ft² (17.8 m²) but you also have a huge porch with three doors which adds roughly 67 ft² (6.25 m²) of the area, so the total protected area is around 259 ft² (24 m²). Please read more in my full review. This tent is here for all good reasons, as you realize from the picture this is a cabin style tent and particularly tall with 90 inches (229 cm) peak height. This is also a canvas tent except for the floor which is synthetic. Ther tent is designed for all seasons and for all climates, so what you have here is a true 4-season tent. As typical for most (but not all) canvas tents, this tent is not freestanding so you have to stake it down properly. After that, it becomes self-supporting with its 6 telescopic steel poles. You also have two extra poles which you use for an awning configuration shown in the picture above. The tent has 2 doors which are with windows, and you still have 4 separate windows. All the openings are with mesh and with canvas. The total area is not particularly big for the declared 6-person capacity, you have 108 ft² (10 m²). The tent is very heavy, 92 lb (41.7 kg). Please follow the link for more. With its 229 cm (90 in) of the peak height, this tent surely deserves to be here in the list. But as you realize from the name, this is also a canvas tent, a breathable and pleasant structure. The declared capacity is 9 people but the floor area is not so big, you have 140 ft² (13 m²) and you have one single room. The poles are thick steel so this structure is able to withstand a lot of wind pressure in spite of such a height. The tent is with 3 large windows and you have a double layer structure here, with mesh and canvas panels to preserve the warmth when needed. This is a tent for all seasons and climates. This is a heavy structure with 64 lb (29 kg), and it is also bulky when packed, you have a bundle of 42 x 14 x 14 inches (107 x 36 x 36 cm). It is also rather expensive, please follow the link for more. Wenzel Shenanigan 5 Person Teepee Camping Tent. This Shenanigan 5 Teepee is modest in the area with its 86 ft² (8 m²), but it is very tall with its peak height of 90 inches (229 cm). This is a beautiful summer camping structure with a single central pole and one door. But it has three great windows with mesh and zippered panels visible in the picture above. The tent is a single layer type and the floor is fully sealed thick polyethylene with welded seams. The tent is nicely ventilated with 2 low and 3 high vents. The pole is steel and this is a telescopic design. The weight of this tent is 10.75 lb (4.88 kg), so this is light enough even to be carried on shorter hiking excursions. 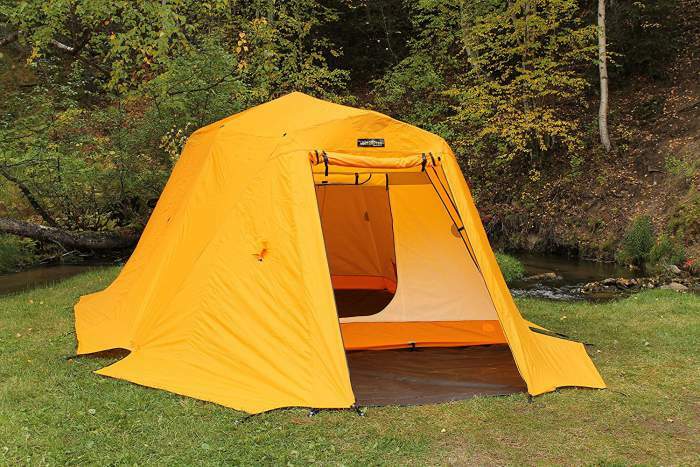 This Ozark Trail tent is here because of its height which is remarkable 92 inches (234 cm). But this is also currently the largest dome-style tent on the market. So you have a structure which is almost exactly a hemisphere with the diameter is 16 ft (488 cm). The total area is 201 ft² (18.7 m²). As you realize I had plenty of reasons to include it also in my list of extra large family camping tents. The tent is a single layer design and the poles are added from outside. You have two doors and eight windows, all of them are with mesh and zippered panels. As the name tells you, this is also a tent with an integrated light system. So I have included it in my list of lighted tents. There are 10 fiberglass poles that create the impressive dome which you see in the picture. The poles have many cross points so the structure is very stable and strong. But they do not provide info about waterproof rating and this is a tent for summer camping, it is best to avoid areas with lots of rain. 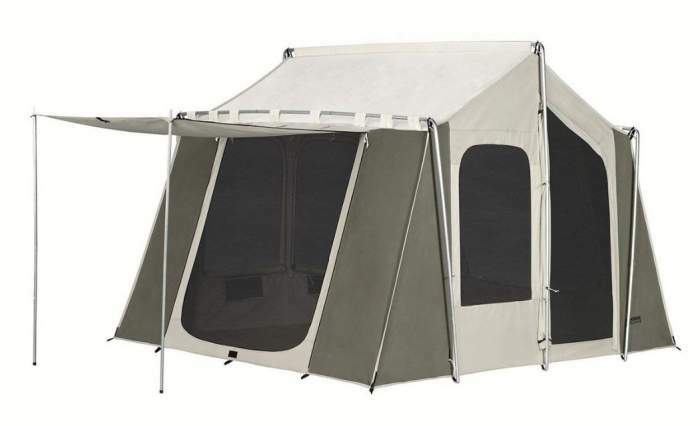 This Carson 14 tent is unusually tall for a cabin style tent, with the peak height of 94 inches (239 cm). It offers 182 ft² (17 m²) of the floored area in its three rooms, but it also has a screen room so the total area is 276 ft² (25.8 m²). The screen room is not floored and you can use it for sitting and cooking. Note that the bigger part of the screen room is protected from the rain because of the fly, although it has no panels on the sides. This is why I have added it to my list with 4-room tents. The two side rooms are square and the central room is pentagon in shape. They all are with real walls in between, but they are connected with huge doors. They all also have huge doors to the screen room. It is worth mentioning its 6 huge windows with mesh and zippered panels, so the whole structure is very pleasant and nicely organized. Please follow the link to read more. 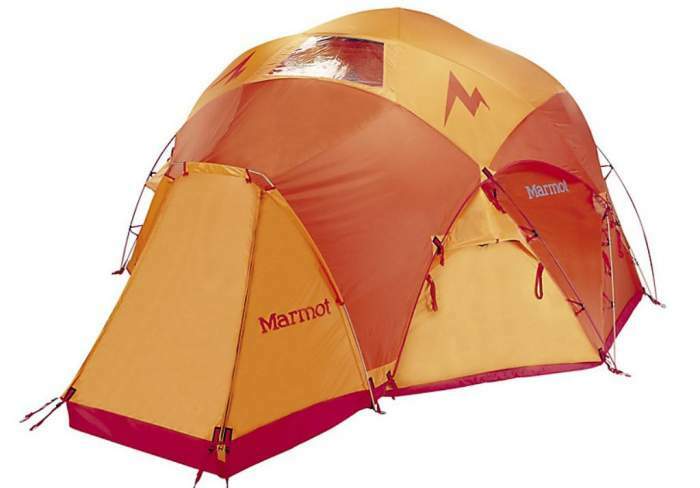 Marmot Lair 8 Person Tent. This Lair 8 is a very tall tent with the peak height of 96 inches (244 cm) which is very unusual for a dome tent. This is a true winter tent built for extreme weather conditions, with two waterproof layers and the best quality DAC aluminum poles. I have included it in my list of tents for cold weather. The tent offers an area of 165 ft² (15.3 m²) and you also have 40 ft² (3.7 m²) under the vestibule. So this is lots of space for the declared 8-person capacity. You have two doors, and one vinyl window on the roof. The structure is semi-freestanding because the vestibules must be staked down to be functional, while the main part is fully freestanding. Please follow the link for more. Winterial 6-7 Person Teepee Tent. The structure which you see in the picture looks like a traditional tipi, but this is all built from modern material and you have a fully sealed floor. 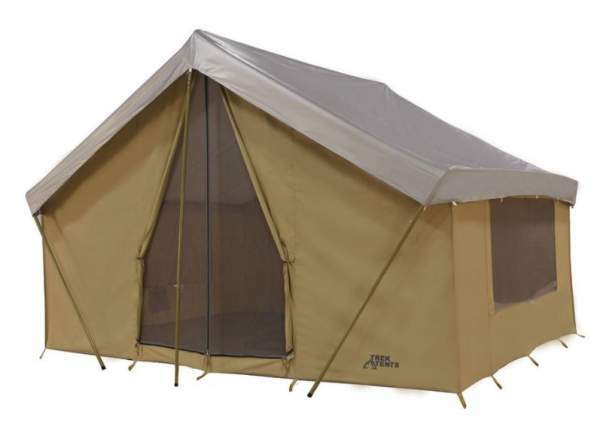 The tent is with 2 doors, 4 windows, and also with 4 vents plus the top vent. All the windows and the doors are also with mesh so you can use them for ventilation. The tent is good enough for all seasons. The area is around 119 ft² (11 m²) and it is supported by one central aluminum pole. The structure is not freestanding, you have to stake it down properly before you raise the top. The waterproof rating is 1500 mm, and the fabric is 210T polyester. Note also that this is a very affordable tent. With 108 inches (274 cm) peak height and with the completely vertical side walls that are 72 inches (183 cm) high, and with 8 nice windows, this tent looks like a house. The official capacity is 8 people and the floor area is 126 ft² (11.7 m²). This is what some call a frame tent which means that the frame sets up completely separately and it is also fully freestanding and incredibly strong. The tent is added separately as well as the fly and the floor. This is a very heavy tent that comes in several separate packages, so the weight is 218 lb (99 kg). You have a flapjack included so the tent is ready for a wood stove and obviously it is very suitable for a 4-season use. I have included it in my list of cold weather tents for camping. Note also that it is very expensive, you will find the updated price in the link given here. 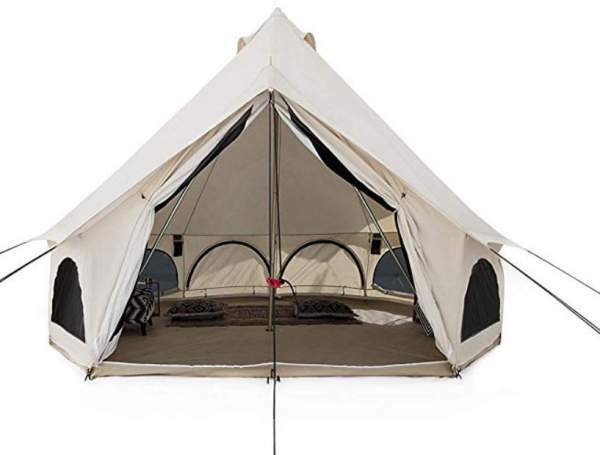 This Sierra 16 is a canvas tent as you see from the name, and this is also a particular design. Obviously, it is very tall, but this is only in the central area where you have a single pole that supports the whole structure. The tent is with one double door and it is gigantic as you realize from the picture. There are also 4 windows. All windows and the door are with mesh and with canvas as the second layer. The floor is synthetic. The size is 16 feet in diameter, so this gives around 200 ft² (18.6 m²). The official capacity is 8 – 12 people. The tent is heavy, 74 lb (33.6 kg). Please follow the link for more. Tahoe Gear Bighorn XL 12-Person Teepee Tent. This Bighorn XL teepee is here because of its height, so you have 297 cm but note that this is a teepee so the volume inside is not so great. The declared capacity is 12 people, and you have 230 – 237 ft² (21 – 22 m²) of the area so indeed this the tent can accommodate such a number of users. The structure is with a sewn-in floor so you have a full protection from the ground. This is a modern teepee so you have one central pole and therefore the structure is not freestanding. 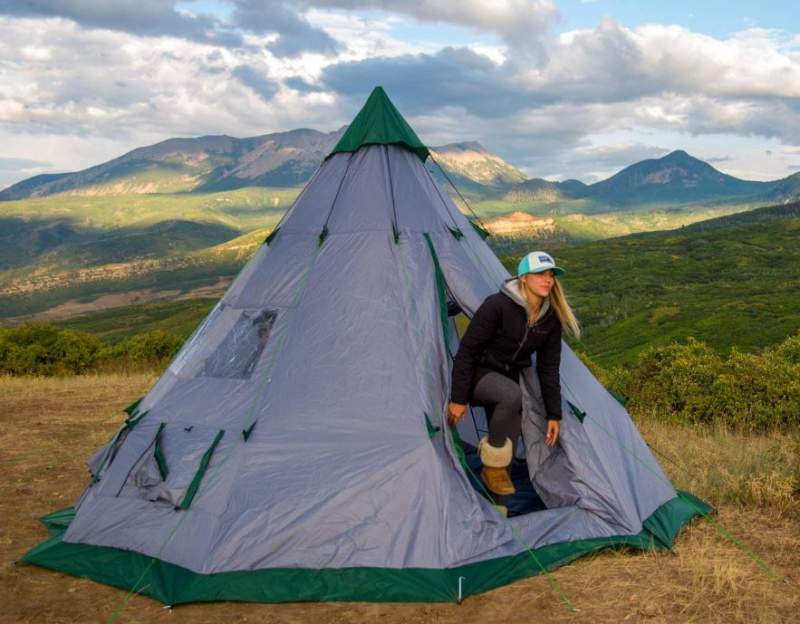 One person can easily set this tent up in under 15 minutes. There are 2 doors and 4 PVC windows and you also have 4 low vents plus a top vent. The waterproof rating is 1000 mm and this should be enough for such a steep roof construction. Note also that it is very affordable as well. 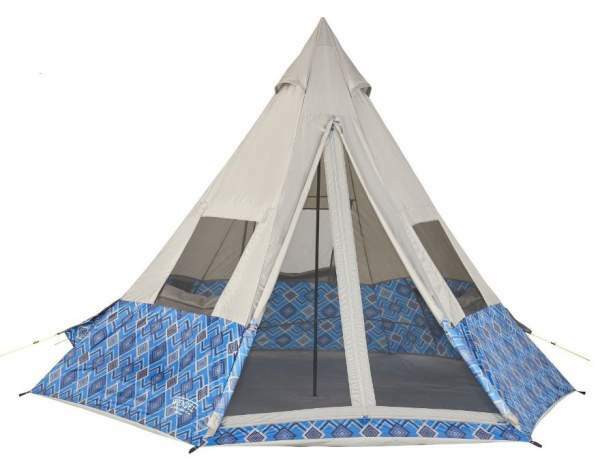 This Teepee tent is at this position in the list because of its height which is 119 inches (300 cm). You would expect such a height from a tipi tent. This is a single pole structure with 4 solid windows and 5 vents. It offers more than 230 ft² (21 m²) of the area. The official capacity is in the range of 10 – 12 people. Note that in spite of such a size, one person can easily set this tent up in 15 minutes. For such a size, the tent is lightweight, it weighs 23.15 lb (10.5 kg) and it is also very packable, the carry bag measures 32.3 x 10.2 x 9.8 inches (82 x 26 x 25 cm). The pole is steel, and the tent body is polyester with 1000 mm waterproof rating. On the floor, you have a thick and waterproof polyethylene. Note also that this is a very affordable tent. This tent is in such a position in the list because of its height which is 125 inches (318 cm) in the central area. As you realize from the picture and the name, this is a bell-shaped tent so the height is not so great close to the walls, but even there you have 3 ft (91 cm). It offers the floor area of 201 ft² (18.7 m²) and the declared capacity is 8 people. Obviously, this is more than enough for such a number of users. If you need a tent for all seasons, this is it. So you have a flapjack for a stovepipe to use with a wood stove if this is about some cold weather camping. But note also that this is a canvas tent so it is completely breathable yet waterproof and it is perfect for a warm environment. There are many windows plus a huge mesh door for ventilation, and you also have 4 vents. Note that the windows are 3-layer structures so you have mesh, PVC panels, and canvas. You will need a car for transportation, the tent is very bulky when packed and it is also heavy, it weighs 95 lb (43.1 kg). Please read more in my full review. Eurohike Hampton 6 – 210 cm. 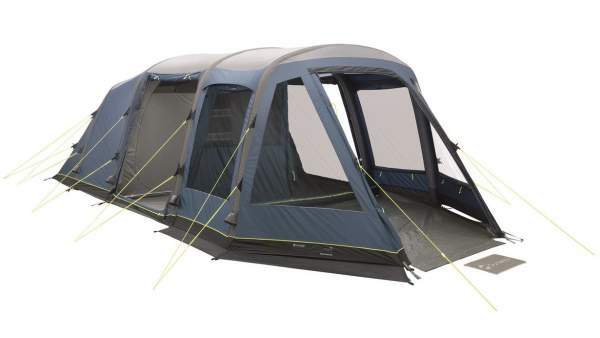 Vango Capri 600 XL – 210 cm. 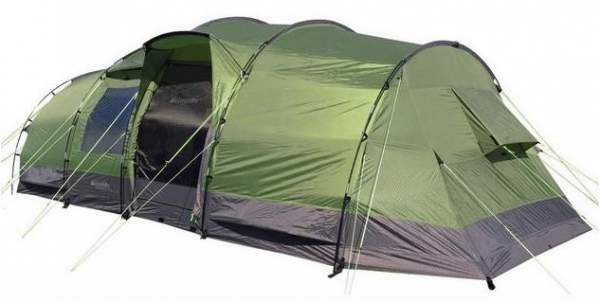 Vango Avington 600 XL – 210 cm. 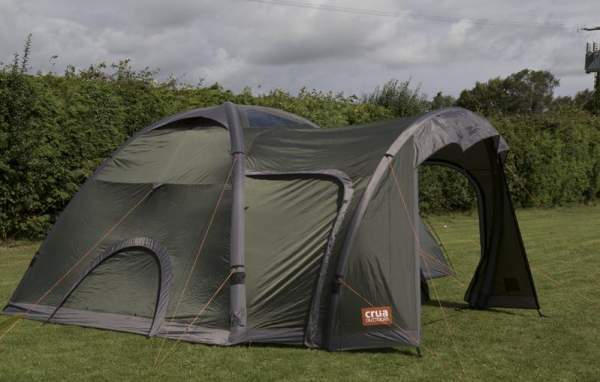 Vango Iris 600 XL – 210 cm. Crua Loj 6 – 211 cm. Ozark Trail 20 Person Tent – 211 cm. Ozark Trail 16 Person Tent – 211 cm. Alps Mountaineering Camp Creek 6 Tent – 213 cm. Alps Mountaineering Camp Creek 2 Room Tent – 213 cm. Browning Camping Big Horn 5 Person Tent – 213 cm. Coleman Prairie Breeze 9 Tent – 213 cm. Core 9 Person Instant Cabin Tent – 213 cm. Core 10 Person Instant Cabin Tent – 213 cm. Eureka Copper Canyon 6, 8, and 12 – all of them 213 cm. Ozark Trail 15 Person Tent – 213 cm. So this was my list of very tall tents for camping, in fact, these are the tallest tents available on the market. The list will be updated when some new models appear, so bookmark this page and stay tuned. Do not miss to check the second list given above, with the tents in the range 210 – 213 cm. The height difference between them and those above 215 cm is not substantial, and you have a huge variety of types and features.